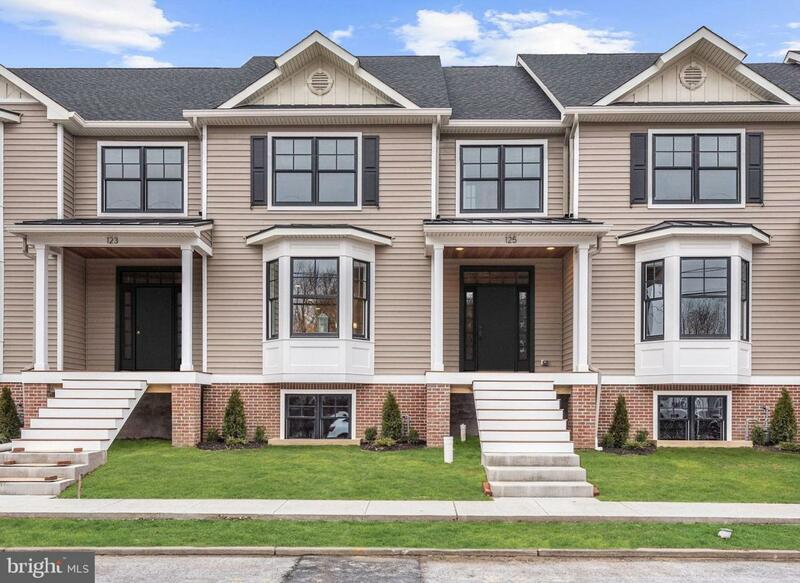 Gorgeous new construction townhouse built with quality craftmanship by Hartman & Shiffer located in the heart of Moorestown. No detail missed and no expense has been spared in this 3 bedroom 2.5 bath custom home. Enter from the Mahogany and Brazilian wood covered front porch into the foyer with large coat closet. Site finished hardwood floors cover both the first and second floors along with an abundance of natural light from the large windows. The first floor layout is open with 9 ft ceilings, crown moldings and recessed lighting. The living /dining area has a bay window and a fireplace. The gourmet kitchen features quartz countertops, Shaker cabinets, under cabinet lighting a spacious island and a complete Kitchen Aid stainless steel appliance package that includes refrigerator, gas range, built in microwave, oven hood, dishwasher and wine refrigerator. Off the kitchen is a back deck designed to match the front porch with the Brazilian and Mahogony wood. The first floor is complete with a bonus room ideal for an office or playroom. The beautiful master bedroom offers a tray ceiling, walk in closet and ceiling fan. The master bathroom is absolutely stunning with its double sink, tile floors and seamless shower enclosure. 2 additional bedrooms feature ceiling fans, over sized windows and ample closet space. The laundry room is located on the 2nd floor for added convenience plus a pull down attic with tons of floored storage. On the lower level of the townhouse you will find the garage, a finished space that can be used as a mudroom an an additional basement storage space. 4 units are for sale. Unit 125 is nearly complete. Buyers still have time to make custom choices on the 3 additional units that are being built, 1 interior and 2 end. Also listed in Bright as 123, 127 and 129 E 3rd St. Plans available for an elevator and 4th bedroom layout. Upgrades to kitchen packages, finishing basement space, etc all available. Please contact listing agent for additional information. Association fees are approximate.